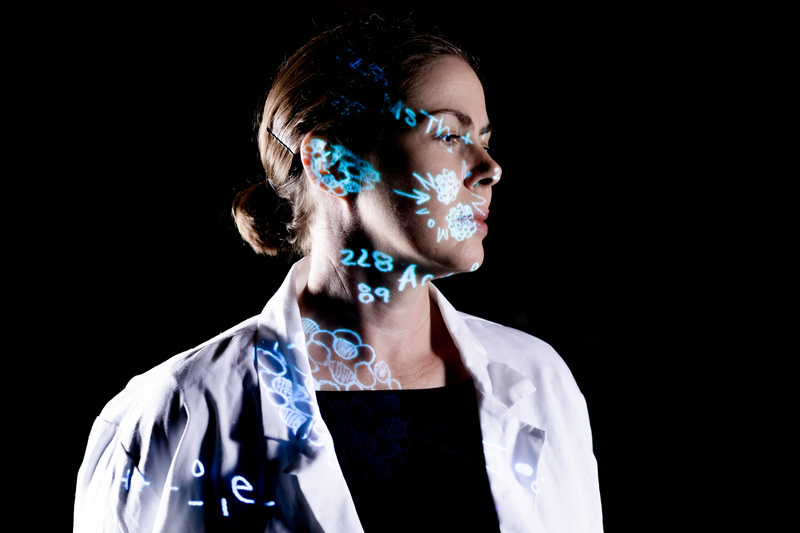 WATERTOWN – One by one, the stories of women who loved science at a time when it didn’t love them back are being told. The women in question were heavily involved in some of the most important scientific discoveries in history, but never received the recognition, awards or financial rewards for their work because their work in many cases was credited to men they had worked with. And now comes the story of the woman who helped unlock the secrets of nuclear fission in Jennifer Blackmer’s memory play “Delicate Particle Logic,” now being presented by Flat Earth Theatre at the Mosesian Center for the Arts. Flat Earth has made it part of its mission statement to tell these types of stories, so the troupe jumped at the chance to produce this view of the life of German physicist Lise Meitner (Christine Power), seen through the eyes of Edith Hahn (Barbara Douglass), the wife of Nobel Prize-winning chemist Otto Hahn (Thomas Grenon), who had a 30-year working relationship with Meitner. Playwright Blackmer imagines a visit between Meitner, an Austrian who fled Germany and the Nazi regime to Sweden with the secrets of nuclear fission, and painter Edith Hahn, who as the play opens has fled from her own personal demons and from society in general, put away in an asylum/nursing home by husband Otto for a rest of “indeterminate” length. In Edith’s mind, the visit from Meitner allows the story to employ both flash-backs and jump-aheads; because of the haziness of memories, at times Blackmer will stage the exact same incident or scenario in several different ways. Meitner’s partnership with Hahn began at a time she was literally confined to a basement of a lab and not even allowed to use the bathroom in the building. It was a time when female scientists were barely acknowledged and were paid a pittance, when they were paid at all. For Meitner, the deck was already further stacked against her, her life and work because she was Jewish, a fact that eventually endangered her life as the Nazis rose to power. Putting the science aside, this is also very human story of two brilliant scientists who lived for their work, who were the Yin and the Yang in the search for atomic secrets, Hahn, a radio chemist and Meitner, a physicist who was finally able to connect the dots on what Hahn had discovered..
A tight, well-matched ensemble cast makes it all happen. 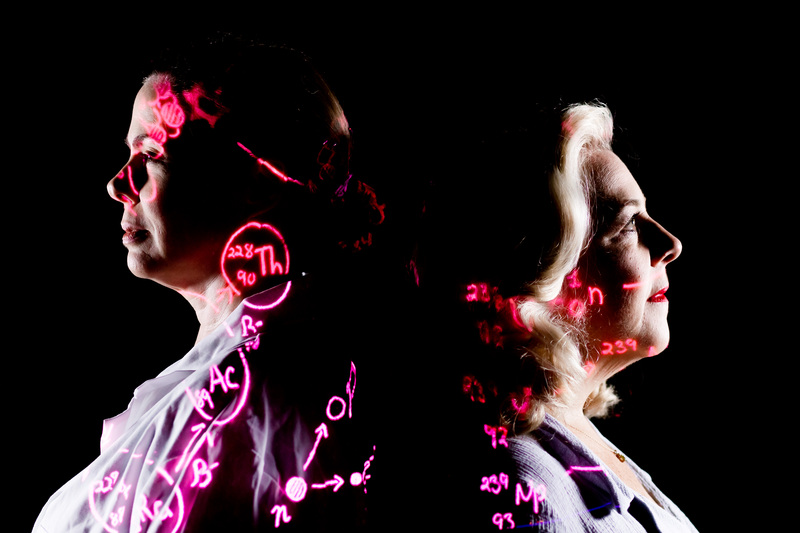 Both Power, excellent in last season’s “The Women Who Mapped the Stars,” and Grenon (“Red Velvet’ at OWI) have done some fine work with local theaters. Douglass is also strong as a wounded soul, a woman on the decline who briefly comes alive when her beloved art comes into the picture. Michael Lin and Matt Arnold do an excellent job of filling in all of the other blanks in the various characters that the Hahn and Meitner encounter..
Grenon’s Otto is driven, charming when he is courting Edith but one who often neglected his wife and son for weeks as a time. Meitner has essentially given up every other aspect of hr life for her work, only to be stripped bare when she is forced to leave everything – her work, papers, money and friends – when she is dangerously smuggled out of Germany for a barren existence in Sweden. The playwright also speculates about other aspects of Hahn and Meitner’s partnership. At two points during Meitner’s visit Edith pointedly asks her: “Did you love him? “Does it matter?” is her reply. Playwright Blackmer also doesn’t shy away from the ethical issues that confronted Hahn as he became part of the German war machine using deadly poison gas in World War I, or his continuing to work on atomic fission at the Kaiser Wilhelm Institute during World War II as the Nazis were devising the Final Solution. There is no firm answer on what he knew and when he knew it. Then came the fallout from their discovery. As Meinert said: “We split the atom – and the world changed.” The race to develop atomic weapons is a disheartening side effect. Yes, there is a lot of science in “Delicate Particle Logic,” but not so much that the eyes of this classics major glazed over because there are also dramatic tension, excitement, regret – all the emotions you can think of then two humans strive for a goal, find themselves on the top of the mountain, and then wonder if it was worth the climb. And, of course, the ultimate bitterness for Meitner is her accomplishments are all but buried as the Nobel Prize is awarded to Hahn, who is portrayed as trying to share credit but ultimately failing. Director Betsy S. Goldman has cast well, elicited strong performances across the board, and employs brisk pacing. “Delicate Particle Logic” entertains, tells a story and educates you about someone you should know, and the role she played in changing the world forever.